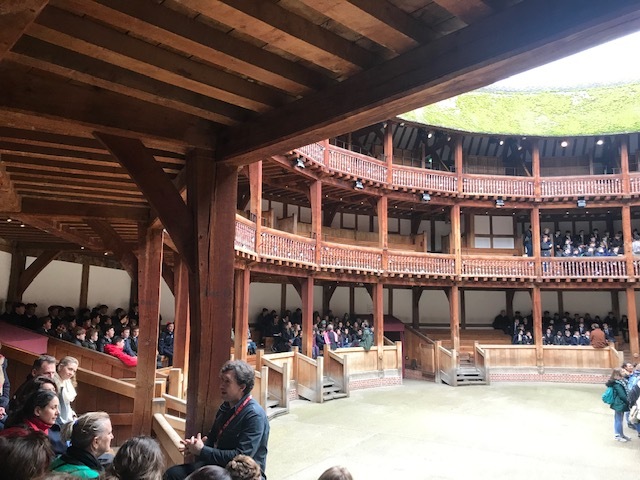 A visit to London would not be complete – especially for theatre lovers – without visiting the modern incarnation of Shakespeare’s Globe Theatre. This loving reconstruction of the original theatre built in 1599 is located on the south bank of the Thames in Southwark, a few hundred meters from where the original stood. 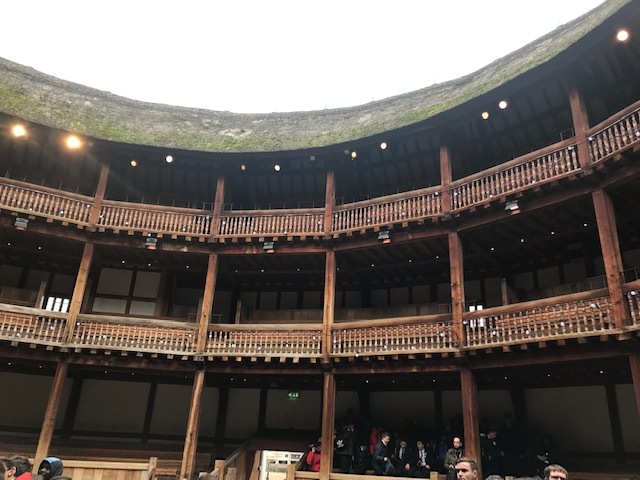 It is an amazing edifice from its thatched roof down to its pit where audience members must stand throughout an entire performance. 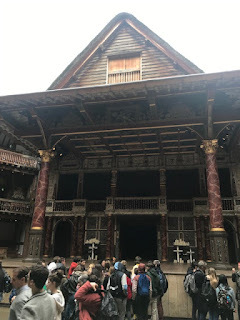 American actor and director Sam Wanamaker spearheaded the campaign to build this recreation of the Globe, and his desires were such that it would be faithful down to the last nail. Spending much of his own money, his desire to build the theatre as an open-air building evocative of a past era sprang as a dream in 1970 and became a reality when the theatre opened in 1997. 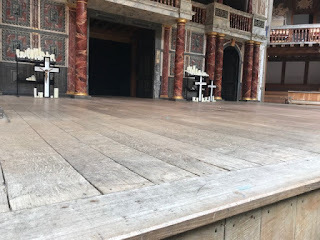 Today the indoor Sam Wanamaker Playhouse (opened in 2014) is next door and is a tribute to the late founder of the Globe. Wanamaker’s goal was to have modern audiences experience Shakespeare’s plays as an Elizabethan one would have. The open-air concept was practical in Shakespeare’s time – candles were not only expensive but dangerous as well. Like the original, the modern Globe has been built of solid oak throughout, though now it comes with electrical lighting, a sophisticated sprinkler system, and flame-retardant protection for the thatched roof. On my visit one of the things that thrilled me the most was to see so many school field trips coming to the theatre. On a normal March Friday in London, I witnessed dozens of school groups arriving, merrily coming over Millennium Bridge (no, the Death Eaters from Harry Potter did not really damage it though it is under renovation now) and excitedly touring the place. 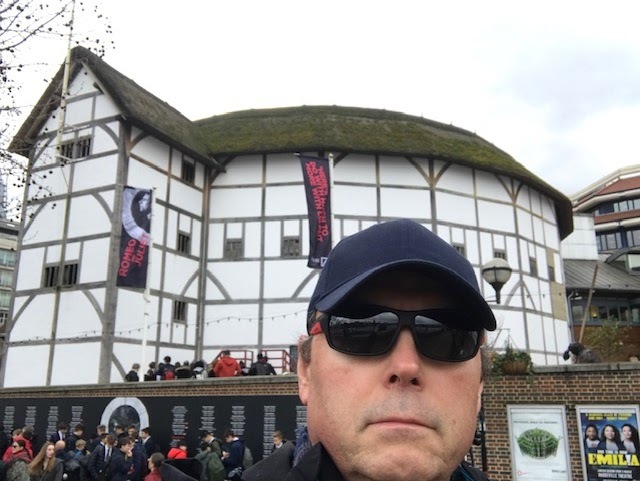 I stepped through the doors into the heart of the theatre – the pit where the original Groundlings stood on an earthen floor and modern ones now stand on concrete. I stared up at the sky as a few drops of rain fell on my face, a chilly reminder of what performances could be like during inclement weather. In Shakespeare’s time Groundlings spent a penny to stand in the pit; today it’s five pounds for the privilege – and umbrellas are never allowed. The stage juts out into the circular pit area, allowing for Groundlings standing there to be close to the action. Three levels of seating – known as galleries – are covered and basically allow for intimate viewing from every angle. The stage is covered by a roof – as are the galleries – and the inner stage roof features images of the heavens and a trap door for lowering or raising characters. The stage itself is plain and bare, but on my visit it was decorated with candles and crosses for that day’s performance of Romeo and Juliet. 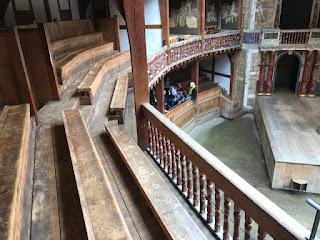 The nature of the stage’s construction puts the actors right out into the audience; a balcony above it can be used for characters in scenes like the one with Juliet and Romeo. In the center of the stage, a trap door provides an entrance or exit for the underworld. Sitting in the galleries allowed me to get a feel for what it must have been like during Shakespeare’s time, though now strict codes keep audiences to a maximum of 1,400 – Shakespeare’s audiences could reach up to 3,000 people for a performance. The seating is just as it was in the past – low wooden benches that are solid oak and not that comfortable. It is easy to imagine how crowded the galleries could have been in the past with people squeezed in next to one another, but today it is more civilized with numbers marking the seats and cushions available for our tender modern tushies. As I sat there listening to an extremely knowledgeable tour guide, numerous other tours were being conducted simultaneously, but they never interfered with one another. The staff spoke lovingly of the theatre, Shakespeare, and its mission to keep live theatre accessible to the public for years to come. When I sat in the second-floor gallery looking down at the stage, I realized the brilliance of the construction from a much simpler time. The stage is clearly visible, the acoustics are ideal, and the daylight – even on this overcast day – provided all that was needed for a performance. After the tour our group was unleashed in the gift shop where various books and items associated with Shakespeare and his works are available. I was moved to purchase a paper model of the Globe which I hope to construct with my son at some point, and a LEGO model of the theatre was for display only. I was tempted to lift a replica of Yorick’s skull from Hamlet and say, “Alas, poor Yorick!” but I didn’t allow my inner thespian to get the best of me. As I left the theatre, I looked back at the magnificent building that bridges the gap between centuries. With its antiquated construction made of resilient oak and thatched roof, it calls to us collectively to honor theatre’s past and respect it, but its presence also is a reminder that theatre is a living and breathing thing, something timeless and universal that connects all of us. 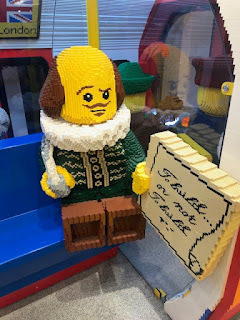 If you still need convincing of Shakespeare’s place in literature and history, consider what I saw on the other side of the Thames in the LEGO Store in Leicester Square. There I found a large figure of Shakespeare made out of LEGO blocks. 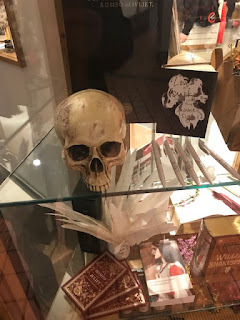 The character is holding a quill pen in one hand and in the other a piece of paper with the words “To be or not to be” on it. If nothing else, it convinced my ten year old that I just might be onto something with “this Shakespeare thing” I am always talking about. 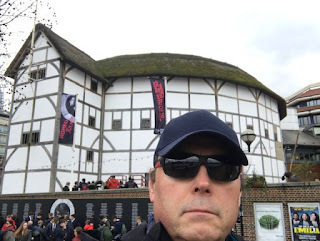 I highly recommend a visit to Shakespeare’s Globe Theatre on your next visit to London. You will not be disappointed.